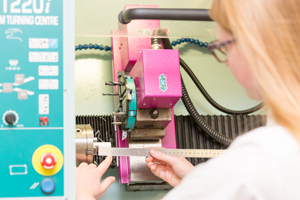 In Technology pupils combine practical and technological skills through creative thinking to design and manufacture products that meet human needs. They learn to think creatively to improve the quality of life and solve problems as individuals and members of a team. Through technology material areas, pupils develop confidence in using practical skills and become discriminating users of products. They apply their creative thinking and learn to innovate. In Years 7 and 8, students study Technology across the three areas of Product Design, Food and Textiles. In Year 9, the students opt from a suite of practical subjects and can choose to study any one or all three material areas. 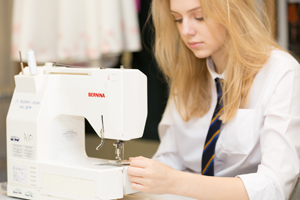 At GCSE (KS4) and A Level (KS5), students can study courses in Product Design, Materials Technology, Food Preparation & Nutrition and Fashion & Textiles. These courses provide a programme of practically based projects to develop skills in research analysis, creative design, product development, scientific analysis, planning, manufacturing, testing and critical evaluation of their work. Interest in technology is reflected in the thriving clubs held at lunchtime and after school. Students in our Product Design club have the opportunity to design and make a host of products from an array of different materials. In the Textiles Club students create unique, fashionable and fun products from a variety of recycled materials. Students have worked with the charity “Dress a girl around the world” to make clothes for young girls in developing countries. 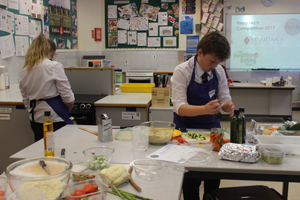 Within the Cookery Club students gain the experience of making a range of exciting and different products to further enhance their practical making skills. Pupils have worked with local chefs to develop these skills and have had the opportunity to make a range of seasonal products.